This unique seminar gives you a comprehensive introduction to FinTech for Non-IT Professionals, what FinTech is all about and how it is changing financial, banking and commercial systems and the world. Discover the full scope of FinTech. Explore the key FinTech development & implementation issues. Discover how operational costs can be reduced and efficiency increased. Explore data sharing and transparency in the light of data security and protection needs. Get on the notification list to be eligible for the ULTIMATE EARLY BIRD PRICE. (***Promo code only available to those on the list). The speaker has experience in this topic...Speaker know how to teach with simple language. Fintech history; When did it start? 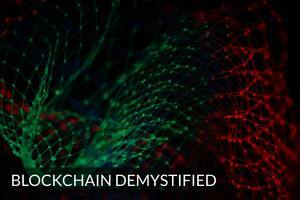 Why is the Blockchain relevant for business? A detailed look at the different areas that FinTech is taking over including actual examples. How many FinTech startups are there? Why has M-Pesa been so successful? No formal requirements, though it is recommended you should have basic business knowledge and a broad familiarity with fundamentals of business finance. Digital strategists operating in the finance sector. No Walk-Ins allowed. You must register in advance to confirm a seat. Exclusive discount code to those on the email notice list.